Become an 'Award Winning Christian Author' by entering your book or graphic novel in the only 'family friendly' book contest running! Hi everyone! We are taking a break! We have done 3 years of Christian Book Awards, and are now stopping to give the Director and staff time to work on theri own projects! Save your entries - the next set of quarterly Christian Book Awards will start in 2020! WHY THIS CONTEST IS DIFFERENT THAN ALL THE REST: We don't judge authors against other authors, we judge books based on the clearly published standard below. We know award-winning when we see it - because the judges - Mr. Rich Collins (Award-winning Christian Author and movie maker) and Ms. Jennifer Lusong (Award-winning Christian Illustrator) are award-winning multiple times! This is the difference. Your work judged against the standards below = Your award level! PUPOSE: The purpose of the Christian Book Award Contest is to recognize authors who publish ‘Christian family friendly’ books and graphic novels for Christians to read and enjoy. America needs to start encouraging and rewarding those who produce wholesome entertainment. RULES: To enter the contest provide your $15 payment by PAYPAL at the contest link below and then e-mail your book in ‘pdf’ or ‘word’ format to the e-mail address raeganandrjinspace@aol.com. Entries will be judged by an award winning Christian author (Mr Rich Collins) and an award-winning Christian illustrator (Ms Jennifer Lusong)! Entries will be confirmed by return e-mail along with the date of your contest when we receive your entry and payment. 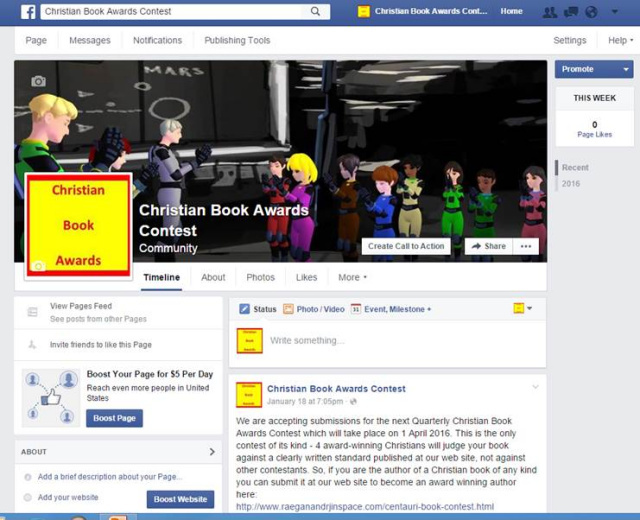 ‘Christian Book Awards’ contests will occur on 1 January, 1 April, 1 July, and 1 October. Your entry will be entered in the next contest run. So if you enter the contest on 15 June 2016, your book or graphic novel will be judged on 1 July 2016, and so on. Determination of your award level (Gold, Silver, Bronze, and Honor) will be provided to you in an e-mail on the 14th day of the your contest month, respecfully. So if you entered the 1 July 2016 contest, your notification of award will be made by e-mail on 14 July 2016. We do not accept paper copies of books, only pdf or word format sent by e-mail; the reason is because the 2 judges live in different locations and to mail copies to different judges would make the cost to enter a paper copy too expensive, and we are trying to keep it as low as possible. Decision of the judges is final, and no refunds will be provided under any circumstances. We use paypal for secure transactions! CATEGORIES: Entries can be submitted in one of 5 categories: 1) Graphic Novel / Comic, 2) For Young Kids/Elementary School age to read, 3) For Young Adults/Middle School age to read, 4) For Teens to read, 5) For Adults to read broken down into Fiction and Non-Fiction, It doesn't matter what genre it is it will fit in one of the 5 categories above. So whether you have a kids book on space adventure, a book for teen girls about funny or embarassing hgih school friendships, or an Amish romance novel for women, just tell us what age category it should go in when you send it to us. WHAT DO YOU WIN: Awardees receive 1) A review by award-winning Christian judges; 2) Recognition as an 'Award Winning Author' for the rest of your life, and your book will be an 'Award Winning Book', 3) A digital award certificate. 4) A digital seal to display on copies of your book or web site, 4) Winning Books will be posted at our Facebook page and Web Site for promotion and verification purposes. 1) Only complete stories will be allowed to enter the contest and be judged. We will not judge 'summaries' or 'half-finished' works. Don't sweat it. Just knuckle down and finish the story! You can do it! 2) Books can be previously published, there is no date limit of when it has to have been published or finished. You could enter a book you did 5 years ago or yesterday. 3) Only 'Christian family friendly' stories will be allowed to enter and be judged. The definition of ‘family friendly’ is that your book or graphic novel entry would be something you would not be embarrased to read with your Mom or Dad on one side, and your daughter or son on the other. I am not going to give you a list of things that would not be 'family friendly' because little kids go on this site. No entries with innapropriate material will be accepted or judged. If an entry is submitted that is not 'family friendly' it will be returned with the money and pdf file. Sorry folks, we don't want to judge anyone or anything, but this contest is to encourage writers and illustrators to produce 'family friendly' material. 4) Only stories in English will be accepted and judged. 5) Only stories from a Christian world view will be accepted and judged. 6) You do not have to have your story published yet. Unpublished works can be entered and judged. 7) You do not have to have your story professionally done, we encourage independant and beginning authors to submit stories for grading. Gold: Front to back cover high quality whether written or graphic novel. No spelling, punctuation errors. Professional cover. If graphic novel or picture book, colorful professional illustrations. A totally 'UNIGUE' and interesting story for that genre that is fully developed with characters the target audience will fall in love with. This level of entry is one a Christian would read over and over again and be one of their favorite books or series. Check the award winning free graphic novel download 'Mission to the 3 Suns' at this web site. That's a Gold. Don't be intimidated though, this is not at the 'MARVEL COMIC' level. A professionally done comic at that level would be a Gold plus plus. We are not looking for that level to award a Gold to you. If God has given you that kind of talent awesome, and we will recognize it, but that is something that does not come along very often, and will not be required to get a Gold. The basis for a Gold is a totally unique book from cover to cover, and a Christian reader who says after seeing and reading it: Wow, I have ever seen anything like that before, that is amazing! Silver: A high quality, 'family friendly', Christian story with no spelling or punctuation errors, is a very interesting story, containing at least 1 new or interesting development unique to that genre that has never been done before, that a Christian kid or adult would read once, put down for a week or so, but eventually would want to read again. The basis for a Silver is a Christian who says wow, I have read alot of for example Amish Romances, or Westerns, but I have never seen one set in ??? ?, or about ???? - Maybe the entire book is about the main character, say Stephanie, who finds her Grandmother's diary after her death, and she is reading and visualizing about how her Grandmother fell in love and got married - and the book really is about someone who is already gone to heaven, that would be unique. So basically for a Silver the standard is a story in a genre that has been written about, but has a unique twist! Bronze: A solid quality 'family friendly' story with no spelling or punctuation errors that a beginning level author would write in an existing genre that a Christian kid or adult would read and find interesting and like it, not list it as one of their favorites because it has no new features or twists. This level of book is a good achievement for a new author or illustrator in an existing genre but contains nothing new. This does not mean that you have not produced an award-worthy book, it just means that your Amish Romance or Western Adventure is the same as every other one that is on a Christian's bookshelf already. Honor: A 'family friendly' story produced with maybe a few minor errors, but it is 99% straight, and has no unique story twist or idea, ie if you decide to write an Amish Romance for ladies, or a Western adventure for young boys about cowboys, or a story about teenage girls in highschool and it is a story about friends in highschool, you do it, Even professional books have errors - I have read many books that I have purchased in the book store that contained spelling errors in them, even after professional editing and publishing. If you have produced a complete story and are ready to show it to the world, but it has some errors, this is probably what you are going to get awarded. NUMBER OF ENTRIES SUBMITTED HAS NOTHING TO DO WITH LEVELS AWARDED: If you produce and enter the contest with a family friendly graphic novel or book that is a GOLD you will get a GOLD. If you produce a book or novel that is an HONOR level, that is what you will be awarded. Your award has nothing to do with how many entries are received during a given quarter. Next quarter we could have 5 GOLD and no other awards, or 1 of each, or no GOLD but 2 SILVER. Rest assured, your level of award will not be downgraded because some very talented Christian submitted a 'MARVEL QUALITY COMIC' two days before you submitted your first kids story book. SPONSOR: The sponsor for this contest is Richard Collins, a multiple award-winning Christian filmmaker and author, registered 'artist/author' and 'home business' owner in the State of Virginia license #293309. 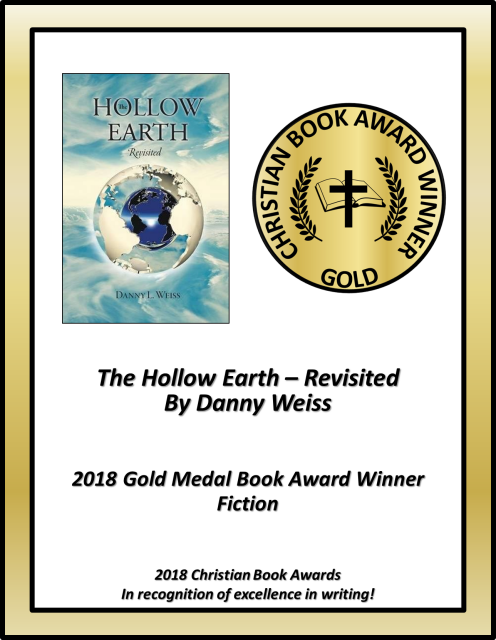 Christian Book Award Winners for the 1 October 2018 Christian Book Awards! 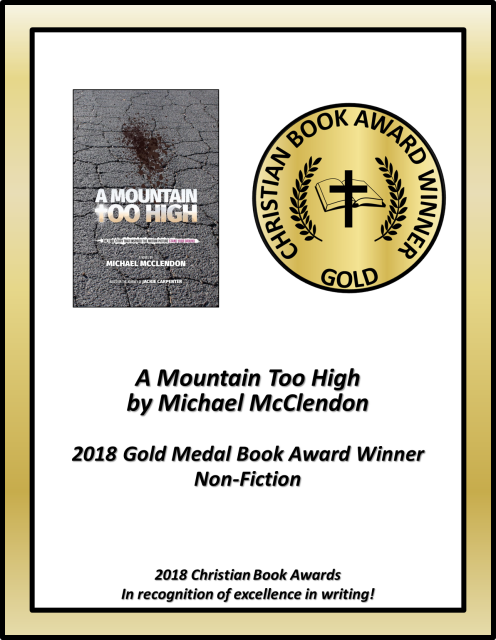 ‘A Mountain Too High’ by Mr. Michael McClendon. This Non-Fiction book is based on the story of Jackie Carpenter whose son Jason is accused of murder, and she fights for his freedom. 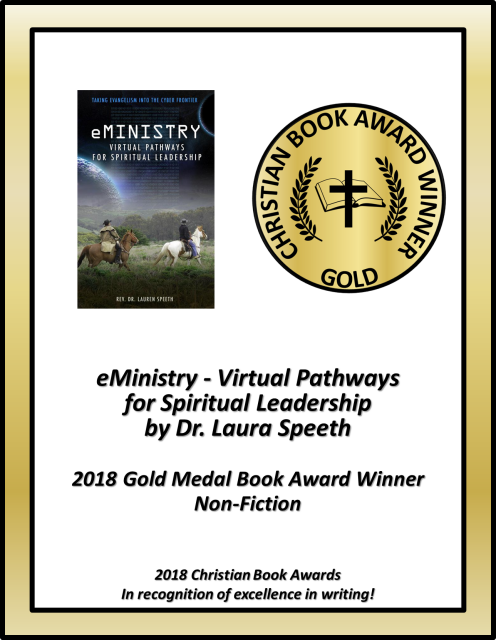 ‘eMinistry- Virtual Pathways for Spiritual Leadership’ by Dr. Laura Speeth. This Non-Fiction book serves as a guide for ministers looking to learn how to effectively communicate and expand their ministry online. Christian Book Award Winners for the 1 July 2018 Christian Book Awards! 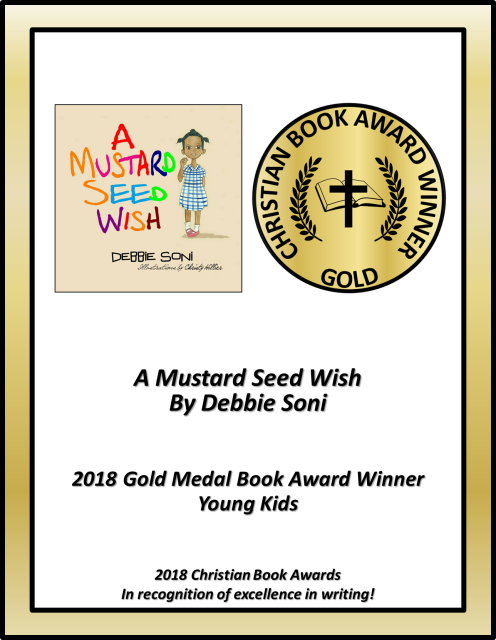 ‘A Mustard Seed Wish’ by Debbi Soni. Zola is a little girl living in 1945 World War II. Through an adventure with a seed, she learns about the kind of faith it takes to make her wish come true. ‘The Hollow Earth – Revisited’ by Danny Weiss. An exciting fiction story about a man who finds a peaceful civilization living at the center of the Earth. 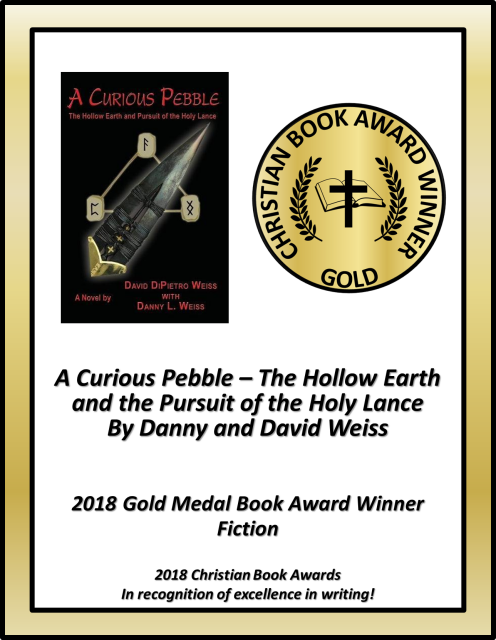 ‘A Curious Pebble – The Hollow Earth and the Pursuit of the Holy Lance’ by Danny and David Weiss. The exciting sequel to ‘Hollow Earth – Revisited’! A draft resister flees the US to Iceland tempted by absolute power and destiny of the world for either good or evil while encountering an advanced civilization living in the center of the Earth. 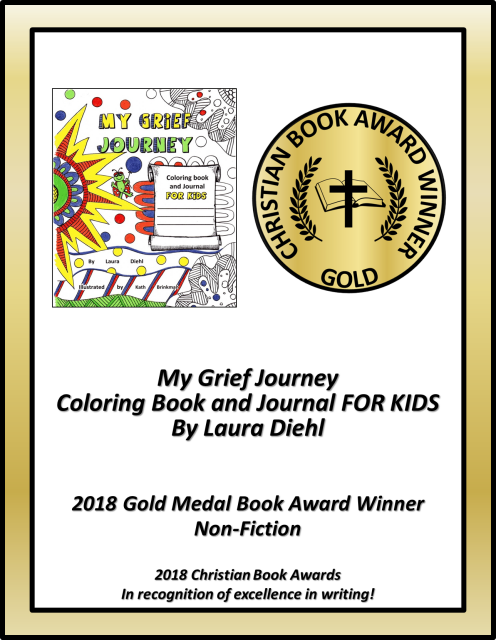 ‘My Grief Journey: Coloring Book and Journal FOR KIDS’ by Ms. Laura Diehl. Do you know a child who has faced a deep loss, such as the death of a parent, sibling or grandparent? Are you looking for a way to help them sort out their thoughts and emotions? My Grief Journey: Coloring Book and Journal for Kids is for any age (including adult “kids”) who are learning how to live after the death of someone dearly loved and deeply missed. 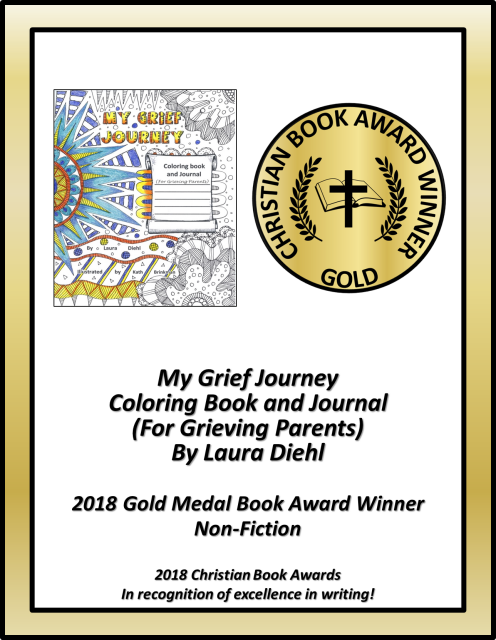 ‘My Grief Journey: Coloring Book and Journal (For Grieving Parents)’ by Ms. Laura Diehl. Are you a grieving parent, looking for ways to help relieve the intense pain, anger, and confusion? Are you struggling with why God would allow your child to die. Do you want to move toward hope and life again? Christian Book Award Winners for the 1 April 2018 Christian Book Awards! 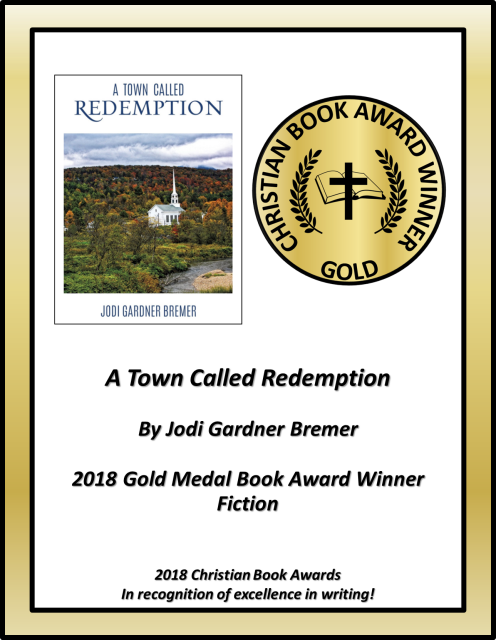 ‘A Town Called Redemption’ by Ms. Jodi Gardner Bremer. This is a very creative fiction story! Tex Hammond is a young man with a secret. A secret he’s trying very hard to run away from. Then one cold, rainy day, Tex finds himself stranded in the little town of Redemption. Just when things seem to be at their darkest, along comes Martha Tucker, a retired schoolteacher. With her purple galoshes and her thermos full of black coffee, Martha reaches out to Tex. In so doing, she sets off a chain of events that will help lead Tex Hammond on a personal journey of faith. A journey that will help Tex realize it’s time to stop running, and start trusting. Christian Book Award Winners for 1 December 2017 Christian Book Awards! 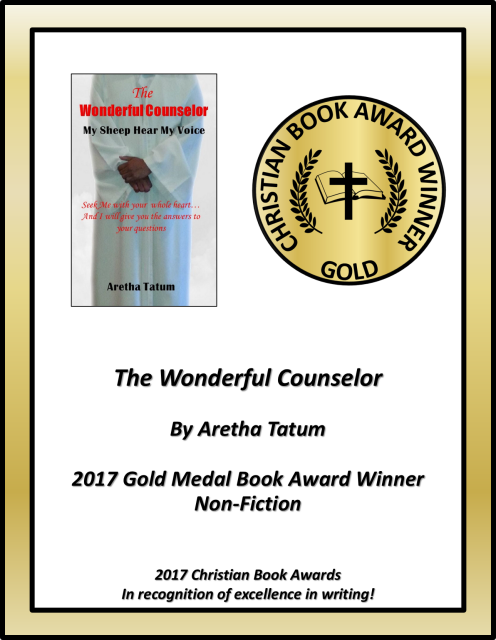 ‘The Wonderful Counselor’ by Ms. Aretha Tatum. The Kingdom life is so much more than attending church services on Sunday. As born again believers in Christ we are not part of a religion, we are in a relationship, and its personal. We must seek to hear from God to find out our purpose, to receive comfort, direction, and quite often correction. The Wonderful Counselor is a testimony of supernatural encounters and words of wisdom received from the Lord. This book will encourage you to start your own sessions with the one who is called in Isaiah 9.6 Wonderful Counselor. 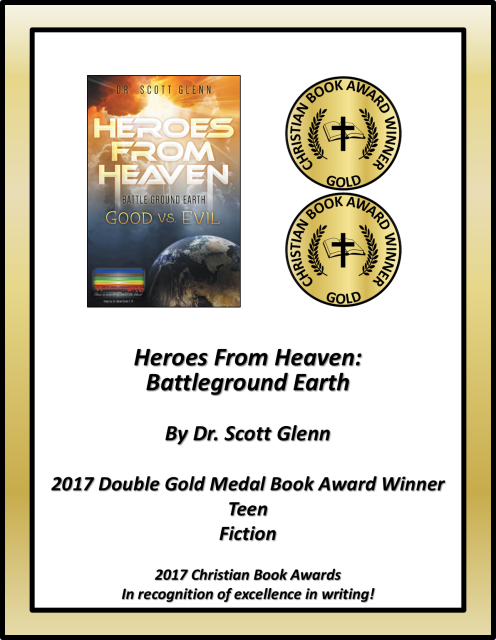 ‘Heroes From Heaven: Battlefield Earth’ by Dr. Scott Glenn. This fiction story is about a future battle between good and evil! Gen. Barzna, a vicious killer, is commissioned by MaTias—an evil and heartless 7 CA leader who intends to take over the world—to destroy the religious faithful. However, the Heroes from Heaven, biblical characters, arrive on earth, and the religious faithful are resurrected, including LacHain and two of the 7 CA leaders who had converted before they died. Together, they defeat MaTias and Barzna, and help to restore a destroyed world, but not before Barzna comes to a realization that he has been on the wrong side of history all along. 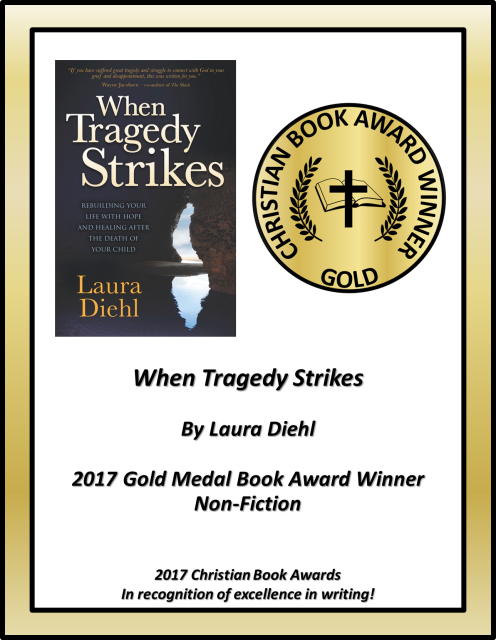 Christian Book Award Winners for 1 September 2017 Christian Book Awards! ‘Angel on Assignment’ by Wanda Carter Roush. If your family loves the Elf on the Shelf and you want to keep the fun going, check out Angel on Assignment. It’s a children’s activity book that offers a Christian alternative to the elf, teaching children about the angels who watch over them, not just at Christmas but all year long. 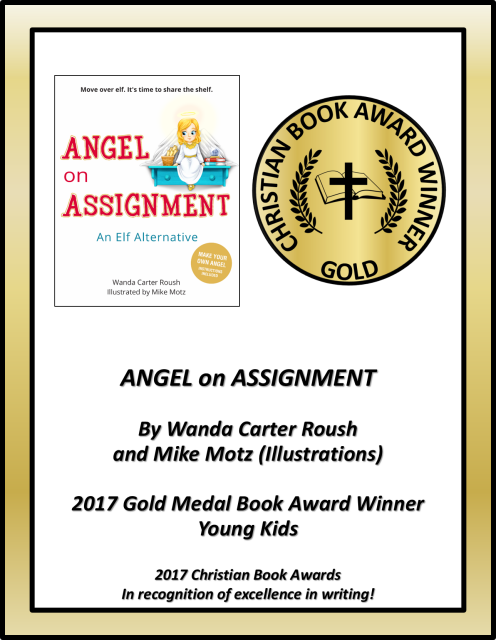 With beautiful illustrations and rhyming verse, Angel on Assignment takes readers through the angels’ roles in the Christmas story and presents the ways guardian angels look out for boys and girls today—and how children can act as angels in disguise for friends who need help. See how many angels your child can find—some are hiding! At the end of the book, you’ll find detailed instructions for making your own angel. When you’re finished, you can introduce your angel to your elf and let them keep an eye on things. Then post a photo of your creation to the book’s Facebook page, and check out the angels that other families have made! 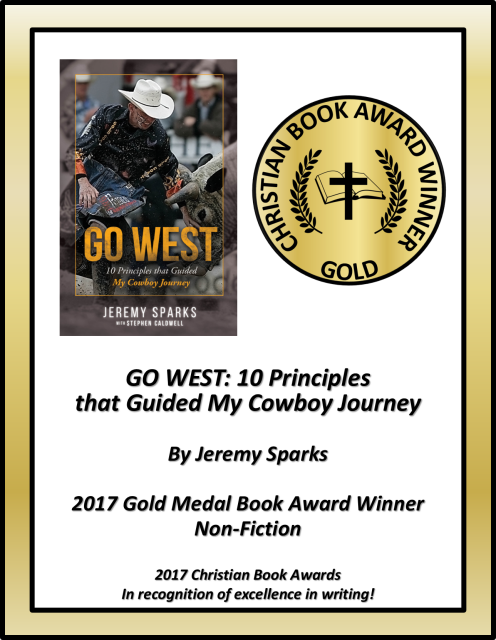 ‘Go West: 10 Principles That Guided My Cowboy Journey’ by Jeremy Sparks. Many of us would say it takes guts and a little bit of crazy to step toe-to-toe with a powerful 1,800-pound bull. For bull fighter Jeremy Sparks, it took faith and a calling from God. With a sincere desire to keep God at his center, Sparks recounts the western way of life, his death-defying journey to the Hall-of-Fame, and the Cowboy Principles that kept him grounded in his faith. His journey includes the flat-lining of his dream after being electrocuted when he was 18, the stalling of his dream again after choosing to serve in the Armed Forces following 9/11 (the Pentagon later branded him as the “only professional bull fighter in the history of the Air Force”, and, at 36, being enshrined as the youngest cowboy ever in the historic Cheyenne Frontier Days Rodeo Hall of Fame. The 10 principles of his testimony prove that if God can use him, He can use you, too! 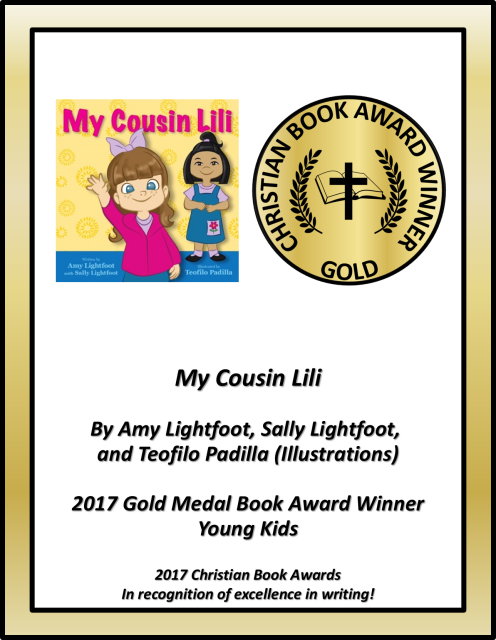 ‘My Cousin Lili’ by Amy Lightfoot, Sally Lightfoot, and Teofilo Padilla. Written by the niece of a missionary in Honduras, My Cousin Lili is a colorful and delightful story about a young girl from Honduras and all that she teaches her new cousin, Amy, in the United States about life and children with disabilities. The book highlights Lili's uniqueness as a child with autism spectrum disorder in a beautiful way and is illustrated by a talented Honduran artist who is Deaf. 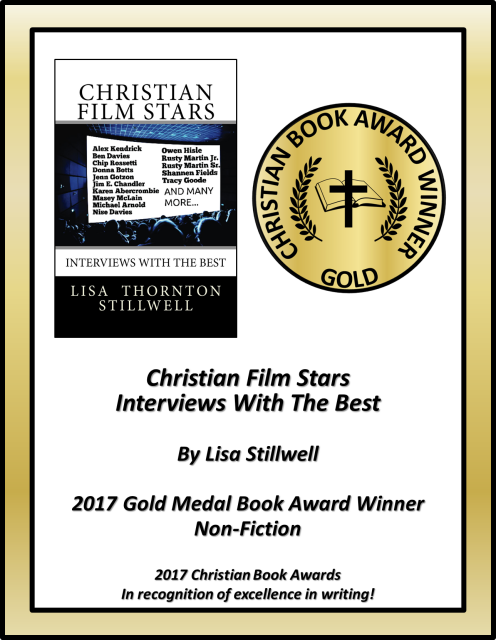 'Christian Film Stars: Interviews With The Best' by Lisa Stillwell. Have you ever wondered about actors and producers in Christian Films? What led them to where they are and what compels them to be involved in the Christian Film Industry? Lisa Stillwell didn't just wonder but interviewed some of them and put it into a book! Christian Book Award Winners for 1 July 2017 Christian Book Awards! 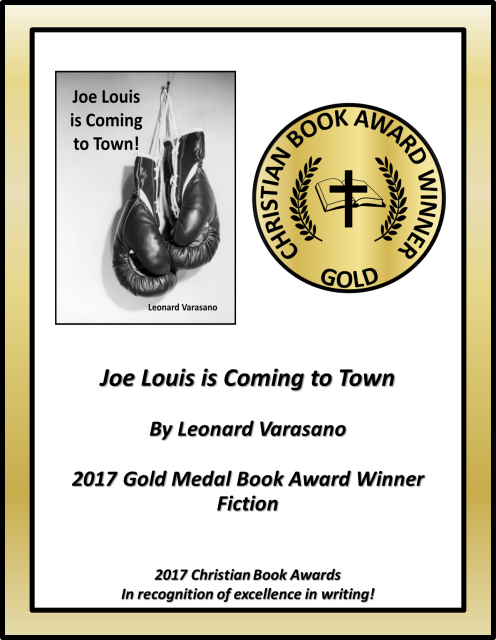 ‘Joe Louis is Coming to Town’ by Leonard Varasano. A Fiction Book about a decorated war hero returns home to Alabama and befriends a recently relocated youth! 'When Tragedy Strikes’ by Laura Diehl. A Non-Fiction Book which is written to help those who have had their faith shattered by tragedy and loss, especially the loss of a child. Chriatian Book Award Winners for 1 October 2016 Christian Book Awards! 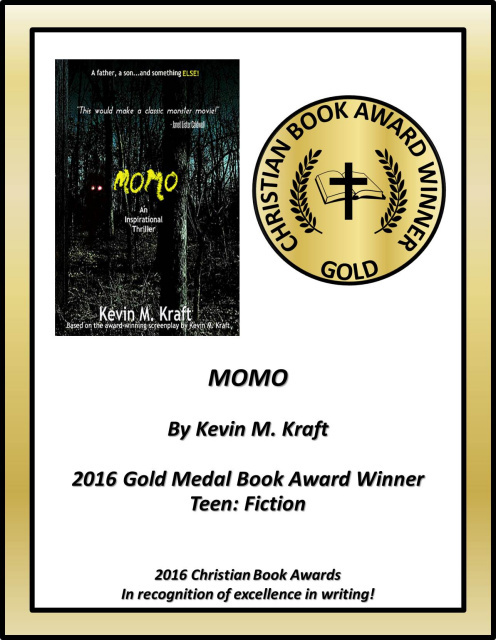 'MOMO' is a GOLD Medal award winner in the 'TEEN: Fiction' category! A Father, a son, and something else!! This inspirational thriller is set on the plains of present day Missouri! In this awesome story a father named Mark and his son Evan team up to defend their town from the Missouri Monster, a legendary and ferocious Big Foot creature bent on destruction! Christian Book Award Winners for 1 April 2016 Christian Book Awards! 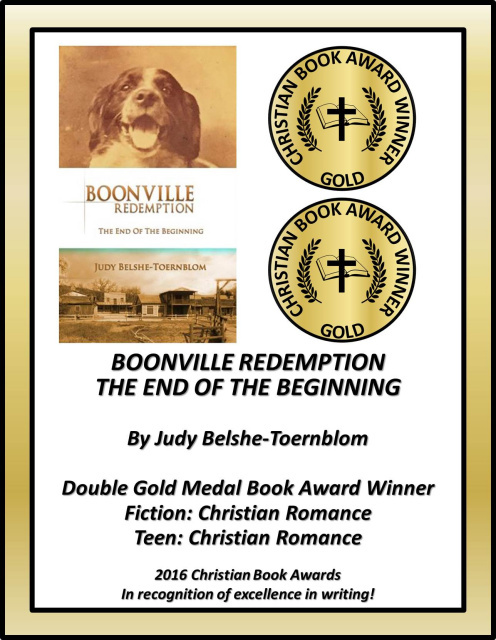 'Boonville Redemption: The End of the Beginning' is a Gold Medal Award winner for both 'Fiction' and 'Teen' categories! This wonderfully written book by Mrs. Judy Belshe-Toernblom is a Christian romance based in the early West of Anderson Valley California; A story of loves triumphs and losses in the harsh new frontier of the 1800s to the early 1900s spanning nearly 30 years; There are so many ways that love can complete someone or cause great damage; The prequel to the movie Boonville Redemption! See the details at the landing page in the bottom left web page tabs!